East West Players, the nation’s largest producing organization of Asian American artistic work and the longest-running professional theater of color in the country, concludes its 47th anniversary season, themed “Spirited Away,” with the musical “Chess” — book by Richard Nelson, lyrics by Sir Tim Rice, and composed by Björn Ulvaeus and Benny Andersson. “Chess,” which is currently in previews and will officially open on May 15, is directed by Tim Dang with musical direction by Marc Macalintal and choreography by Marc Oka. Rounding out the ensemble are Cesar Cipriano (“The King and I,” “Miss Saigon” national tours), Stephanie Mieko Cohen (“Les Miserables”-Broadway), Jasmine Ejan (“Peter Pan”-national tour), Shay Louise (“Miss Saigon”), D.T. Matias (“A Chorus Line”-international tour), Maegan McConnell (EWP’s “Pippin” and “A Little Night Music”), and Alex Sanchez (“Hairspray”). 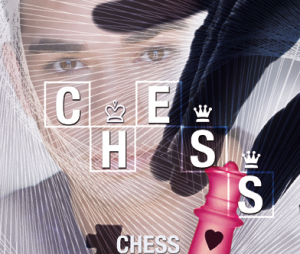 “‘Chess’ is a musical with international themes of breaking down barriers between nations, and having a multicultural ensemble enhances its message for the 21st century,” says Dang, EWP’s producing artistic director. “In addition, EWP is also showing how multicultural casting breaks down other barriers in light of recent casting controversies across the nation. It enriches our theater-going experience, reflects the community in which we live, and offers opportunities to talented artists of color who might not have access to these roles elsewhere. ‘Chess’ is usually performed as a concert focusing on its music and is rarely done as a full theatrical production. From the lyricist of “Jesus Christ Superstar,” “Evita” and “Aida” and the composers of “Mamma Mia!,” “Chess” involves a romantic triangle between two top chess players, an American and a Russian, and a woman who manages one and falls in love with the other. All of this takes place within the context of the Cold War, as both countries vie for international chess victories for propaganda purposes. “Chess” may be best known for its 1980s pop-rock soundtrack that Time Magazine called “one of the best rock scores ever produced,” featuring such hits as “One Night in Bangkok,” “I Know Him So Well,” “Anthem” and more. It is presented by special arrangement with Samuel French Inc. The multicultural nature of the production also extends to the design/technical team and musician ensemble. The design team includes set and projections by Adam Flemming, costumes by Anthony Tran, lighting by Dan Weingarten, and props by Ken Takemoto. The stage manager is Ondina V. Dominguez and assistant stage manager is VIVIS. The musicians include Marc Macalintal (conductor/ keyboards), Jenny Chaney (keyboards), Stuart Espinoza (drums), Khris Kempis (bass), Vincent Reyes (guitar), and Austin Yancey (woodwinds). Support for this production is provided by the S. Mark Taper Foundation Endowment for East West Players, with additional support by the California Community Foundation, Shubert Foundation, The Ralph M. Parsons Foundation, Los Angeles County Board of Supervisors through the Los Angeles County Arts Commission, and City of Los Angeles Department of Cultural Affairs. All performances are staged at the David Henry Hwang Theater at the Union Center of the Arts at 120 Judge John Aiso St. in Little Tokyo. Remaining previews are Saturday, May 11, at 8 p.m. and Sunday, May 12, at 2 p.m. Preview seats are $26. Opening night is Wednesday, May 15, at 8 p.m. and includes a 7 p.m. pre-performance cocktail reception and a post-show reception with the cast and creative team (call theater for ticket price and availability). A special “pay-what-you-can” performance is on Thursday, May 16. Southern California Edison Community Night is Wednesday, May 22. Post-show discussion with the artists will be held on Sunday, May 26. Regular performances run Wednesdays through Saturdays at 8 p.m. and Sundays at 2 p.m. until June 9. Running time is 2 hours, 20 minutes, including a 15-minute intermission. Ticket prices: Wednesday and Thursday, $46 (balcony), $51 (orchestra); Friday, Saturday and Sunday, $51 (balcony), $56 (orchestra), plus $4 per ticket handling fee. Tickets may be purchased online at www.eastwestplayers.org or by calling (213) 625-7000. Student and senior discounts available. Group rates available for 10 or more. Call Alison De La Cruz at (213) 625-7000, ext. 20 for details.